Retro consoles, or mini consoles, have been immensely popular in the past couple of years. Started by Nintendo in 2016 with the NES Classic, which sold millions, companies like Sony, Sega and Atari have joined in. Now Capcom, game company behind many retro hit games, has decided to create their own gaming system. It is called Capcom Home Arcade, and isn't quite the console others have made. 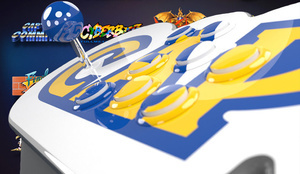 In fact, Capcom's device is more of a mini arcade, a plug-and-play arcade controller that you connect straight to your TV. According to Capcom, there is a total of 16 preloaded arcade hits from when some of us were kids (exhaustive list below). The controller, shaped like a Capcom logo, has two Sanwa JLF-TP-8YT joysticks and eight OBSF buttons for up to two players. Video output is HDMI and charging happens via microUSB. It also supports WiFi for linking to global leaderboards. Capcom is bringing the console to stores on May 25 in Europe for £199.99/€229.99. North American launch is said to happen shortly after.